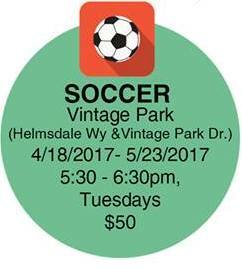 The Southgate Recreation and Parks District is offering a unique class for parents and children to enjoy and learn soccer. The program, called The Itty Bitty Sports Program is for 3 to 5 year olds and their parents. This is a parent participation program, where the children and their parents move from station to station learning the basic fundamentals required for each sport. With the help of trained instructors, this program builds confidence, motor skills and offers a positive early experience to sports. This is a fun way to spend quality time with your child and it's a noncompetitive program. Each registered child will receive a T-shirt on the first day of class and a certificate of completion on the last day of class. More information on the class, which start on Tuesday, April 18 is available here. No Comment to " Southgate Recreation & Parks Offering Parent-Child 'Itty Bitty' Soccer Program "